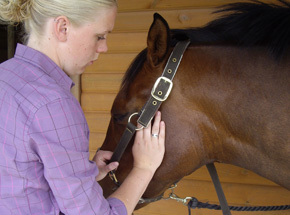 Based in North Leeds and covering the North East of England, Nicola is a qualified Mctimoney Animals Therapist and Equine Body Worker. Nicola has been involved with all aspects of horse and dog care for many years, having two horses of her own which she regularly shows, and a very active young dog, makes her aware of the benefits of McTimoney animal therapy and massage, to maximise performance and maintain overall health and well-being. Nicola’s equine experience ranges from working with competition horses to breeding stock at a variety of equestrian centres. Her dog experience has allowed her to work with everything from simply pets through to show, working and competition dogs. This has provided her with a wealth of experience enabling her to work with young, nervous and difficult animals. Different animal disciplines put different requirements on their bodies, many of which evolution did not design the body to withstand, and therefore it is not surprising that injuries can occur. Just like humans, animals may suffer from back, neck, pelvic and musculoskeletal problems and can benefit from McTimoney therapy. The McTimoney technique is a non-invasive holistic technique that works to align and balance the animals musculoskeletal system, by manipulating any misaligned joints throughout the whole body, paying special attention to the spine and pelvis. It helps to both restore and maintain health, movement, soundness and performance. Combining McTimoney therapy and massage techniques allows the musculoskeletal and nervous systems to be treated as a whole, thus improving overall fitness, stamina and ultimate performance. Regular therapy sessions are useful for rehabilitation following injury and also as part of a general maintenance programme, and preventative measure to head off any issues before they become established.